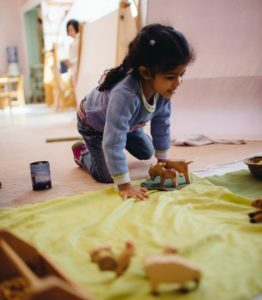 Our Nursery and Kindergarten programs strive to achieve a balance between free play and enrichment activities to encourage independence and the joy in joining together as a group. We encourage natural talents and learning about the world through the gift of imitation, fantasy and invention. We offer half day (9am to noon) and full day (9am to 3pm) classes, along with extended day options (as early as 8am, as late as 6pm). Full day includes a group lunch (packed lunch brought from home), followed by a nap or rest period, and more play. The afternoon is designed to balance and compliment the morning by providing a home-like atmosphere for a smaller group with more intimate activities. 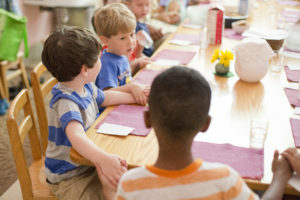 A special first-school experience for younger children. Gentle, simple activities perfect for the very young, including creative indoor play, singing, puppetry, and plenty of time outdoors. Small class size of 8 children with 2 teachers. Toilet training not required for half day, required for full day. Nursery is often a child’s first classroom. Our teachers, the soft environment and the rhythm of age-appropriate activities provide a sense of security and fun for your child. Three Day or Five Day option. Class size of 14 children with 2 teachers. Toilet training required. Our mixed-age kindergarten provides a means for healthy play and learning among the children. Through our teachers, curriculum, classroom materials and daily activities, essential foundations and skills are cultivated. Class size of 16 children with 2 teachers. Toilet training required. For ages 3 and older. Toilet training required. Partial weeks may be available for all extended day options. Please call the school for rates and availability. Applies to half day only. Child brings packed lunch from home.